Last weekend was a coffee shop weekend for me. For the last several months, I've been using my out-of-the-house time mostly on Pokemon Go. Even when I wanted to go somewhere indoors, it'd be to the mall or the library, where I could spin pokestops. But I have been in the mood for Panera, so I went there for breakfast on Friday, Saturday, and Sunday. I also stayed later than I intended to every day except for Sunday. Each time, 4thewords was to blame. On Saturday, I accidentally started a 2000-word battle so, of course, I had to stick around and win it. I wrote 1200-ish words of The Twilight Etherium that day. On Sunday, I didn't much feel like writing The Twilight Etherium, but I didn't feel like writing anything else either. So I wrote it because I had to write something for my daily quota. After Panera, I exercised and ran errands. Most of my shopping is online now. I get groceries by ordering them online at Wal-Mart and then just picking them up, which is very nearly as good as having groceries delivered direct to my house, to be honest. But I still have to go into Costco to pick up stuff there. Back in September or so, I started a sketch and then lost my stylus. I replaced the stylus within a week or two, but didn't go back to work on the picture. This weekend, I decided I really needed to justify replacing my (really expensive) stylus, so I went back to the picture. It felt like it was never going to be done at the time, but now it is looking much closer to complete. It's currently in grayscale, using Artrage's pastel and blender brushes. There are techniques for taking a digital grayscale picture and colorizing it, and I might attempt that. I don't know if Artrage has the right tools to do so or not. Might be interesting to try. I am writing this on Monday, almost entirely because I need to write something to keep my 4thewords streak and I don't really feel like writing at all. I am enjoying being on break and not worrying so much about being productive or not. I've actually thought about spending time on other not-really-productive things. I could start another PBEM! I haven't done one of those in a few months. Or I could try to revive the last one that I let die! Or I could attempt to revive the PollRPG (I still like the illustration that I started of Corydalis and Smoke and never finished. ) I liked the PollRPG characters and setting and I'm sorry I didn't get further on it, but also not sure if people would be able to follow the story enough to vote usefully in polls, if I restarted it. Oh, hey, I could try going back to the gaming store for board game nights! Forgot all about that option. It would be much easier now that I have a car. I don't think I've actually been to the gaming store since the registration on Lut's car expired, which was like four or five years ago now. I did use a rental car a couple of times to go to Fred's place for gaming, I remember, but it's still been a few years. Anyway, what I really want to do right now is work on this picture, and I've got my streak in, so Imma do that now. I still consider myself "on break", so I've been doing whatever I feel like doing in my free time instead of pushing myself to be productive. I still do productive things, but I stop once I stop feeling like it. It's been pretty relaxing, and not very productive. I've written 2500 words on The Twilight Etherium in the last week, which by my current standards is much the same as "not writing at all". I looked up my the old Master Plan(tm) I used while writing Prophecy, and realized that 2500 words a week beats my average for the entire time I was working on that manuscript. For those of you not following me back when I was working on Prophecy, I complained pretty much nonstop about how hard it was to write enough to meet my goals. Anyway, 2018 Rowyn is much better at working on books than 2003 Rowyn. On Thursday 11/29, I talked to an artist on Twitter about commissioning them for a cover for The Princess, Her Dragon, and Their Prince. They tentatively agreed, and I said I would send character descriptions and a contract and such in the next couple of days. This was one of only two writing-related tasks for the month. Doing it required looking through the manuscript for The Princess, Her Dragon, and Their Prince, something I had not done -- well, at all. For many years, I used to read my works-in-progress avidly. This has some good effects: it keeps what I've already written fresh in my mind and I get in some preliminary proofreading. But I mostly did it because I like reading my own work. In recent years, I've been more inclined to avoid reading my own works until I start editing them. This also has good effects: it means I am less familiar with the text when I finally edit it, so I am more likely to see errors, and it means I'm not avoiding writing on the pretext that reading the existing book is productive. Princess is one of the books where I didn't go back to read earlier scenes of the book once I finished writing them. Once I started looking at it to extract info for my artist, I got caught up in reading it. After I got to the end, I decided to start the very early part of the editing process. This is where I make a spreadsheet of all the things I want to change in the text. This part is easy because I make notes as I go along about what I want to change, so I just have to search for square brackets in the master doc and put the items on a spreadsheet. The list had a total of 39 items. I each item scored based on how annoying it will be to do. Most of them are in the "pretty annoying" range: 25 items with a rating of 6 or higher, on a scale of 1 to 10. I went on to complete the four easiest items on the list. I don't like editing so I generally work the easiest items first so that the list will get shorter and less intimidating. Anyway, I have 35 items left to do. The total number of items on the list generally grows as I edit. It's just as well I don't plan to release this book until March at the earliest. One of the sections on the annual self-evaluation form at work is "what are your long-term career goals?" Back in 2016, I looked at this question and decided to put down the truth: "retirement". I talked to my boss about it: "I would like to drop to reduced full-time -- 4 days a week -- in the next year, and drop to part time -- 3 or 2.5 days a week -- in the next two years." To my surprise, my boss was supportive of this: "I would love for you to stay full time, but if you need to reduce your hours, we will definitely accommodate you. We value your expertise and want to keep you in whatever capacity." When Lut was diagnosed with cancer in 2017, this had two opposed effects on my retirement plans. On the one hand, money became much more of a concern, as my expenses went up with car ownership and incidentals. It also became critical that I keep Lut on my health insurance. On the other hand, managing Lut's care was exhausting and I desperately wanted more time in which to do so. In September of 2017, the latter concern triumphed, and I dropped to four days a week. My "day off" was used to take Lut to whatever doctor visits he needed. For a while, this sufficed. But over the last couple of months, I've felt more and more like four consecutive work days is too many, despite the fact that Lut's doctor visits have dropped to one or two per month. It had reached the point where I used PTO to cover the days when I had to take Lut to the doctor, rather than switching my day off to that day. Last week, my boss told me that she had applied for a new managerial position in a new department, and so was leaving her current role. The promotion was official on 11/26, but she's still working in our department for a couple of weeks while the department manager searches for her replacement. My boss will officially transition in January, whether or not a replacement has been hired. Our team have all been in our roles for years, we are all pretty well cross-trained, and we can work autopilot for months without an intermediary supervisor between us and the department head, if necessary. But this news made me think harder about transitioning to part time. My boss and the department manager have been big boosters for me for as long as I've been working for Teenage Bank. The replacement boss will not be someone within my department and I probably won't know them. Would they still support my switch to part time, as my boss had committed to? So I talked to my boss about it: "Would it be better to switch now, while you're still here, or should I wait and see who your replacement is, or possibly stick the department manager with handling it if she's not able to replace you for some months?" Boss: "If you want to do it soon, best to do it now, while I'm still here to manage the paperwork,"
So I emailed her a formal request to drop to part time starting January 7. I decided to wait so I could get the 6 hours of holiday pay for Christmas and New Year's that reduced-full-time employees get, instead of the 4 hours that part time employees get. I considered waiting until after MLK Day too, but three more four-day weeks felt like a lot as it was. My overall feeling is relief at finally pulling the trigger. I have about six months of expenses in my accounts in the bank, and a lot of money in retirement accounts. The cut in my weekly paycheck will be much larger, proportionately, than the 25-33% indicated by dropping from 30-32 hours to 20-24 hours per week. First, my personal insurance premiums go up by a lot: the bank pays 80% of the insurance premium for full time employees and 0% of the premium for part-time. Second, a lot of my paycheck goes to repaying the 401(k) loan for my car, and that amount will remain fixed. I'm not sure how much I will be making, but it will not be much. My writing income is not going to make up the difference. My net income from writing averages to maybe $200 a month, before taxes. But Lut will still have his disability stipend from Social Security, and the house is paid for. I am hoping we can manage without resorting to withdrawing money from my retirement accounts, but if I have to withdraw money from my retirement accounts, well, that's why have retirement accounts. And I am looking forward to spending less time at my day job. Only two 4-day weeks left! When my house was originally built, it had a basement but no interior staircase, only an exterior door. At some point before I bought the house 15 years ago, amateurs added an extension, pretty much for the sole purpose of enclosing a stairwell to the basement. It has electric lights but no outlets and no heat. The shingles from the original exterior are still in place on the inner wall of the extension. There's some space in addition to the stairs, but it's pretty much an overgrown hall. On the main floor, in the space behind the stairwell that was billed as a "sun porch", we put the cat's litter boxes and a bunch of miscellaneous junk we don't have any other place for and never use. Several days ago, I came home to find an enormous pool of liquid in the middle of the floor in the cat's area, surrounded by litter boxes. It looked like water and had no odor I could detect. It looked like more liquid than one cat could reasonably contain. The ceiling and all walls were dry. The puddle did not extend to the walls. I cleaned it up. Maybe Lut or I had sleep-walked, spilled a glass of water there, put the glass away, and left the puddle. I got nothin'. The puddle has not returned since. Today, I went to clean the litter boxes. A dying wasp was on the floor among the litter boxes. I stepped on it to finish off the dying process. Then I noticed another dying wasp. There is a natural spring in the middle of the floor with an invisible trapdoor. The wasps built a nest down there. The cold snap drove them to the main floor but not fast enough to save them. The wasps brought the water in tiny buckets and then took a really really long time drowning. Also, they hid while you cleaned it up. Like Lut, the house has cancer. Wasps and puddles are its tumors. Remember the Basement of Doom? It's spreading. Have you considered cleaning the litter box more often? Or just, you know, cleaning in general. Maybe the wasps are nesting in all that stuff you don't use. Maybe the house needs chemo. Do nothing and the ghosts will let you be. And kill the wasps for you. You don't want HEALTHY wasps next time, do you??? The latest attempt at mobilization (the process of getting Lut's body to make enough stem cells in the blood stream that they can collect enough for a transplant) started 13 days ago. It had been going reasonably well, though not great. We are at the point where "if things went great, we would've been able to collect stem cells from you today". Things had not gone great, and his white blood cell count was still at the "too low to be detected" point. Since the chemo (cytoxin), he'd been given fluids once and platelets twice, but hadn't needed hemoglobin yet. He was feeling about as well as he had before the chemo. Yesterday evening, at 6:30, I went in to talk to him about dinner and he felt hot to me when I touched his forehead. So I took his temperature: 100.4, which is 1/10th of a degree below the "call 911, you are going to the hospital" threshold. I made him dinner and we sat down to watch Blade Runner 2049. An hour later, I took his temperature again: 100.9. So I called 911 and we waited for the paramedics. They arrived and said "oh hey uh we've both been sick lately so maybe you should just take him to the ER yourself." I took him to the ER, then called the BMT 24-hour line. I am still confused as to what the exact order of operations is supposed to be with various symptoms. It seems like "just take him to the ER" is the quickest, to be honest. Anyway, the ER saw him pretty quickly and started him on a course of general antibiotics at once, because with immune-suppressed patients they do not fool around. I hung around the ER until 10:30, then went home to get some sleep. Not very much sleep: about 5.5 hours. Then back to the hospital this morning to see how he's doing. His fever at the hospital had gone down, and some of the readings have been normal, although it had spiked just before I left him this morning. He doesn't have any other symptoms (this is as expected, because when you have no white blood cells they can't cause any of the fighting-off-infections symptoms). They haven't found any signs of infection yet. So possibly it is just an allergen-caused fever, or "fever because that sometimes happens when you have no white blood cells." There is at least a chance he'll be able to proceed with mobilization despite the hospitalization. I am not sure what happens next if we abort mobilization again. Lut thinks there are more options for collection. I kind of thought there was a point where they go "this isn't going to work, just go back to normal chemo and how for the best." But I don't know if we're there yet. Anyway, since Lut's in the hospital, I do not need to be at home taking care of him. So I went to work today. The enforced staycation for the last twelve days was not too bad up until the hospital stay. Daily doctor appointments, sometimes for several hours, but mostly pretty quick. Lut hasn't been able to do much for himself and he can't have restaurant food, so I was doing a lot of cooking and cleaning. But I had a lot of free time too. I finished editing Demon's Lure on Saturday night, so that put me ahead of my writing schedule for the month. I should have gone straight to editing Demon's Sigil, or possibly to working on The Princess, Her Dragon their Prince. Instead I went haring off after the outline for Frost, which is full of problematic material and was originally started in 2015. I'd forgotten all about it until something reminded me of it on Thursday. I doubt I will make this thing my next WIP. But I will let myself noodle at it until the end of the month, because cancer is the worst and my brain deserves some candy. Next month has to be more editing or work on planned next book, though. Assuming cancer doesn't take another turn into AHHH NUUU land. Prayers for Lut's recovery appreciated thank you. I mentioned in Saturday's entry that the next attempt to collect stem cells from Lut would be "three times as bad as the previous attempts." The schedule for it started today, with seven hours of chemotherapy at the clinic. Then he'd be sent home with another IV hooked up to him, and I'd bring him back Thursday to have that unhooked. Then he'd get shots starting on Sunday morning and every day for the next nine days. The consent-to-treatment meeting with the doctor was also this morning. I dropped Lut off at the clinic and went to work, with the plan to pick him up after the chemo was done. Five minutes after work, I got a call from Lut. "You need to be part of the consent meeting," he said. Then the doctor came on the line: "What are you doing at work? He's going to need 24/7 care after having the chemo, today for three to four weeks." Doctor: "This is the same kind of chemotherapy that we use before the transplant. It's a weaker form; if the transplant uses a 10, this is a 6 or 7. But he'll still need 24/7 care! You can't be leaving him alone to go to work!" Me: "... literally no one mentioned anything about this to me." Me: "I need to talk my boss. I will call you back." Doctor: "All right, well, we'll cancel the treatment for today -- "
Me: "LOOK I WILL CALL YOU RIGHT BACK GIVE ME FIFTEEN MINUTES." So I called my boss and didn't reach her, emailed her, called again, got her, and poured out my tale of woe. "So I need to take 3-4 weeks off STARTING THIS AFTERNOON, and then another two weeks sometime afterwards if all goes WELL." Me: "YES. They JUST TOLD ME." Boss: "Well, okay, you better do that then. Let me know what you've got going on and we'll get it covered." I called the clinic back and they started the treatment. Which I didn't need to be there for, so I'm not sure why the doctor was so put out that I wasn't, but whatever. If he gets Lut's cancer into remission I can forgive the lousy communication. Our manager called shortly after I got off the phone with my boss, to give me moral support and let me know that she was also 100% supportive about me needing the time off. Then I spent the next six hours at work frantically trying to wrap up the things that were important, and that I was in the middle of, and where I have some advantage over the rest of my team in experience/know-how. I actually did pretty well at this! I was pleased. I wrapped up the last report just when the nurse called to say that Lut would be ready for pick-up soon. I dashed off some emails and turned my out-of-office on and then went to collect Lut and a pile of new medications and instructions. Lut is doing okay-ish so far. This chemo is much more like what you think about when you hear "chemo", so he has nausea and weird pains and he will lose his hair in the next week or so. It's not too bad yet, but the worst hits in the next day or two. The odds of a successful transplant at this stage are not super-great. If they can't collect stem cells from him even with this, then he will go back to his previous oncologist and we'll manage it with less dramatic kinds of chemo and hope for the best. It's not an instant death sentence by any means, but the chemo-alone route is unlikely to get Lut into remission. Prayers and good thoughts are much appreciated. I did manage to eat more vegetables this month! Not really exercising much. The clinic has tried two more times to collect stem cells from Lut, since the pneumonia in December cut the first attempt short. The last two times, he's gone through all of the shots, plus the bonus shots, but not produced enough to collect. So we start a different and even more awful regimen next Wednesday. Anyway, because of this I've been getting up early and getting home late and not exercising on those days. On days when I go to work at a normal time and get home at a normal time, I usually still exercise a little, but not as much as I used to. 8,000 words beginning the actual PDP book. I did a very little bit of editing on Demon's Lure on the 31st. I actually did multiple drawings this month, surprisingly. This has not been a great month, but given Lut's health issues, not surprising. I feel pretty productive, though. I am happy with the amount of stuff I accomplished. I picked "24" because that is how many items are currently on the list. Me being me, I will be VERY SURPRISED if that list doesn't attract any new items as I start editing. Very few of those items are simple. I need to go through and rank them from easiest to hardest so I can do the easiest one first. Actually, I can tell right now which is easiest and I am going to do it. I have become a big believer in "do the easiest items first", because (a) watching the list get shorter gives me confidence and (b) the hard ones seem less daunting when the list is shorter. But I did also get started on one of the hard items today too, so I'm not a total wuss. Ideally, I want to finish editing Demon's Lure this month and get to first readers, but this seems awfully optimistic, hence the "complete 24 items on the list." In the unlikely event that the list doesn't grow, it'll be done and hey, bonus. So we have begun the next Medical Adventure. It is not arduous by comparison with, say, Frodo's journey to Mount Doom. I am not cut out for the journey from the Shire to Moria, much less Mount Doom. Anyway, the next treatment step is a bone marrow transplant (henceforth BMT). I don't think I explained this here before, but it's actually pretty nifty. They harvest healthy stem cells from Lut's body, and freeze them. Then they hit him with massive chemotherapy that kills everything in his bone marrow, cancer and healthy cells alike. Then they transplant the harvested stem cells back into him. So since it's his own stem cells, there's no worry about rejection or other long-term complications. But before they can do this, there are Many Appointments. Many many appointments. So many appointments. Two weeks ago, they told me they would schedule these appointments for Monday and Tuesday of this week. Last Monday (11/27), I emailed the coordinator to ask if anything had been scheduled yet. She emailed me and the scheduler back and told me (a) they needed to wait for the physical therapy doctor to evaluate him on 11/28 and (b) they had several people ahead of him so they would let me know when they had anything. On Wednesday (11/29), I still hadn't heard. I emailed them again. I did not hear back. I checked Lut's phone for messages. There were none. They did not try to call my phone either. At 6:15 on Friday, I got a voice mail that said "someone in your family has an appointment at [address] on Tuesday 12/5 at 1:15PM." Well. Okay then, I guess this is taking longer than they expected. We go to his original oncology doctor on Monday as scheduled. Oncologist: "Since you haven't gotten the BMT stuff scheduled yet, let's keep on with your treatment here." I called the number from the voice mail back to verify that this was connected with the BMT process (it was) and find out what it was. I scheduled the next shipment of Revlimid, Lut's current oral chemo drug. Then I went to work on Tuesday morning with the plan of leaving early to take him to the afternoon appointment. At 11AM on Tuesday, Lut got a phone call: "We noticed you didn't make any of your appointments this morning! Is there a problem?" They called me, and it turned out they sent us the schedule by UPS. UPS dropped it by the door we don't use. The scheduler thought she had emailed it, or maybe she thought the coordinator had emailed it and the coordinator thought the scheduler had emailed it but in fact no one had. Scheduler: "The ones you missed are all with us so they're easy to reschedule. I will email you the appointments you haven't missed yet and then a list of the rescheduled ones." Fifteen minutes later, I got a schedule. It had SO MANY APPOINTMENTS. One Tuesday afternoon. Five on Wednesday morning. One on Thursday afternoon. Five on Tuesday 12/12. One each on December 16-21. I emailed my boss to explain the SCHEDULING EXPLOSION and when I'd be out for what. Fifteen minutes after that, I got another email: "Here are the rescheduled ones!" There were four more appointments on Thursday morning. Me: WHAT THERE ARE MORE?!? I am basically out of paid time off, but my boss has said I can take unpaid time off THANK GOODNESS. But I am also vibrating with financial stress so I don't want to miss paychecks if possible. So I planned to come to work when possible. Thursday is shot so full of appointments that I'm taking it off. I only missed an hour on Tuesday, because the afternoon appointment was quick enough that I could come back to work afterwards. Wednesday I planned to go to work in the afternoon. The scheduling snafu didn't make anything significantly worse as far as missing time at work. It basically just transferred all the Tuesday morning appointments to Thursday and he had an afternoon appointment on both days anyway. We finally limped up to the medical center at 7:15, and I let Lut out at what I hoped was the right building and went to park. Miraculously, we had indeed gotten to the right building (it's a giant complex of like eight) and the entrance was even near his appointment location. The rest of the morning went unnaturally smoothly. The first appointment saw him ten minutes after we got in and was done with him by 8AM. Our next appointment wasn't until 9AM, but we walked over there anyway to wait. They saw us right away and were done with us by 9AM. Next he had three different kinds of x-rays, which were scheduled to take 90 minutes, first starting at 10:00 and last starting at 11:00. But radiology is walk-ins so they just take you as you show up. They took him within fifteen minutes and were done with him by 10AM. It took a little while to escape the medical center and get back to the car, but I got Lut home, picked up my lunch from the house, refueled the car, and got to work at 10:45. So I'll only be short 90 minutes or so today, too, instead of half a day. We'll see how well tomorrow goes. He doesn't have any walk-in places tomorrow, so pretty sure that will be more like the normal medical experience. At least we don't have to get there until 10AM. Traffic will be about as bad but no getting up at 5:30AM for it. x_x And Lut has lab work so I don't need to make breakfast. I will probably just have cereal myself, instead of making something hot. I won Nanowrimo on Sunday. I made a point of getting it done then, because this week marks the beginning of a new stage of augh so much doctoring in the cancer-treatment process. I am not going to go over it all right now. It's pretty much two solid months of stress and horrible, compounded by my job previously telling me that I could not take unpaid time off and by me being too low on PTO for all the free time the doctors expect me to donate. So I started Monday morning by calling Snake n' Rooter to have them install a replacement shower head, and a replacement garbage disposal. The big disadvantage to garbage disposals is that when they stop working, which they will, you can't just go back to not having one. It messes up the drain flow and you end up with rotting food stinking up the kitchen. The shower head I could've replaced myself, but I figured I would be lazy and have the plumber do it since I needed to call one anyway. Garbage disposals are complicated. I told the plumbing service that I was available 8-11AM and after 3:30. Lut had an appointment at 12:45 and I wanted the plumber to have time to get both done before we left. They called back almost immediately, and said they'd send someone after 3:30. After that, I called the disability check people to get a debit card set up for Lut. Their voice mail did not have an option for "get a debit card" or "talk to a person", although the website promised the former. I tried "send your payment to a debit card" and this got me to a human. Miraculously, I did have all the information they wanted for the debit card. So I got that set up, and the rep told me, "You will get the card in 4-6 weeks and after that it'll take a month or two until the disability payments are sent to it, so he'll get 2-3 more checks." We haven't cashed the checks he has gotten so far. You can't endorse disability checks to someone else, so I can't deposit them in my account. Lut's driver's license expired in 2015, so he doesn't have photo id. I asked the rep if we can put the existing checks on the debit card when it arrives. Rep: "No! But any bank will cash them, even if he doesn't have an account. They're federal checks." I told Lut, "We need to get you a valid id. We should do this today, if the DMV will take your old driver's license as proof of id to give you a new non-driver's id. Before your appointment because we won't have time afterwards." So Lut got in the shower while I went online to see what he needed. A birth certificate, which we didn't know where it was, and proof of residency, which the uncashed checks should work for. It didn't say about using an expired ID to get a new ID. I called, and it went to voice mail, so I left a message. I sent a message through the online form, too. I told Lut that I wasn't going to drag him to the DMV until I knew whether or not this would work. At 10:30, I got a call from the plumbing service: "We have someone who should be able to get there in 20-25 minutes, which is right at the end of your window, I know ... "
I said okay; it didn't seem likely that the DMV would get back to me in time for us to get a new ID anyway. At 11:15, I figured the plumber wasn't coming and turned on the dishwasher. At 11:30, the plumber showed up, and I turned off the dishwasher so he could work. It took him 20 minutes to install the shower head. By 12:30, he'd managed to get the old garbage disposal uninstalled. I shrugged and left him there alone to finish it. I think the chances a guy from a service would steal from me are near-zero. The main disadvantage is that there is a much better chance that some seldom used thing will turn up missing and I will wonder "Was it him?" -_- Even though it won't be. Appointment went as normal. Lut's platelets are up for a change. \o/ But his white blood cell count is still down. Welp. They gave him his chemo shot. Next week will probably be the last of those, as he's going to the care of the bone marrow transplant team instead. At 2:15 (!) the plumber called to let me know he'd installed the garbage disposal and .. the plumbing part worked? "It ran for half a second and then stopped. I think there's a problem with the switch. I'm very sorry, but I'm not an electrician." Me: sor that's $400 to not fix the problem ARGH. After finishing with cancer center, we went home to wait for the social worker. She showed up a little after 4, instead of at 3:30. We filled out the Medicaid app and assembled what we could of supplemental documents they'd want. They wanted a birth certificate too. Social worker: "You can order one online for $31.50 and it'll arrive in a few days." So after she Ieft, I started to apply for a birth certificate online. This went smoothly for several steps. Then it asked me for his parents' full names. Lut's father deserted the family when he was seven. "... do you know your father's full name?" Next plan: tear house apart looking for birth certificate. Lut thought it was probably in the four cubic feet of solid paper jammed into the two drawers near his computer. I pulled out ALL the papers. I dumped 2/3rds of them in his lap, and took the rest -- most of the folders and envelopes and stuff -- into the living room to look through. Fifteen minutes later, I actually found it. After this, I decided to cook dinner. Once in the kitchen, I realized I'd never re-started the dishwasher, and flipped the switch for it. I fiddled with knob and dishwasher lock a few times, and then started cursing the plumber roundly for not only not getting me a working dishwasher but also breaking my dishwasher. Then I decided that, before I finished freaking out and exploded on the phone at the service, I would check to see if dishwasher & garbage disposal had their own circuit and it had flipped. I went back upstairs and dishwasher worked again. After the dishwasher finished, I tried the garbage disposal switch. -- and on the sixth flip it ran. It's run a couple of times since so ... maybe it works fine now? I got nothin'. I wrote a few hundred words in what was left of the evening, and talked to John on the phone for a bit, and played a few games with Terrycloth. Then went to bed early because Lut had a super-early appointment downtown. Google said the drive would take 21 minutes. I alloted 45. It took 28 to get to the hospital, 3 to find parking, and 12 to get from the parking spot to the actual office where the appt was. So we got there about 2 minutes early. Afterwards, Lut managed the walk back to the car. I took him home, went to work, and mailed in the Medicaid application. I still have to mail the social security disability people about why he only gets $30. And get Lut a state id. But these things are fairly straightforward, at least. I might have to take a long lunch to get the state id settled, but I can stay late. Shouldn't need any more time off this week. And this afternoon at work, my boss got back to me and said I can have unpaid time off as necessary. YAY! Next week will be harder, but we will persevere. Lut pointed out that I was very successful In Y!PP at brutal PvP pillaging, but it was all at the poker table, not on the seas. This is ... very apt. It's not that I am particularly good at poker, it's more that most Y!PP players don't really understand how the odds work in Hold 'Em, and I have a high risk tolerance. On Saturday, Lut and I went to Costco so we could try all the samples and because Lut hasn't gone to Costco in several years. (I got a Costco membership again because I have a car, but we cancelled the old one ages ago.) This was Lut's first shopping expedition in four months or so. He did pretty well! But I took him straight home after we left the store. On Sunday, I spent some time on the phone, talking to my parents and to friends. John called, and it was good to hear from him again. I also wrote a thousand words of new material for book two of my duology, to expand one of the denouement scenes that I felt was kind of phoned-in. I got some more Puzzle Pirates in, too. Book Two is basically done at this point. Alinsa hasn't really started Book One layout, though, so there's no big rush to kick Book Two out the door. I will read my expanded scene one more time before I pronounce it done. Probably not gonna do anything else with it, though. Feels weird to finish the second book so easily, when I struggled so long with editing the first. But the second book is a lot shorter, so there was (a) less to edit and (b) no pressure to find words to cut wherever I could. Monday was All The Errands. I am officially a Reduced Hours employee at the bank, meaning I work 30-35 hours a week, instead of 36-40. My current schedule is Tue-Fri, 8 hours a day, with Mondays off because Lut has chemo then. 8:00: Call Disability folks, because they sent a letter asking us to and this is the only time Lut and I are both available at the hours specified. Leave message. 8:10: Call Disability again after realizing they stapled an unrelated person's notice to Lut's. Leave another message. 11:00: Talk to oncologist with Lut. White blood cell count is high enough that he can get chemo, yay! 11:25: Leav Lut to get actual chemo. Go to DMV to get form for handicap placard for car. 11:50 Hang out at Panera with my Surface, and edit The Sun Etherium. 12:45: Go back to cancer center. 12:55: Drop off handicap placard form for doctor to sign. Wait for Lut to finish treatment. 1:15: Stop by Walmart to get frozen veggies for me and baby asprin for Lut, because his next-step chemo treatment has a side effect of blood clots, so they want him to take a blood thinner. 1:30: Stop for frozen custard. 1:40: Look in vain for a place that will sell me a replacement recycling bin because the one we currently have is disintegrating. 2:10: Get home, chat with Lut about various things, put away groceries. 3:00 sit down at computer. 3:15: doctor's office calls that DMV form is ready. 3:20: Get DMV form, go back to DMV, get in wrong line, get in right line, get called up. "Er ... Sorry, we can't accept the form without the disabled person being present, unless you're their spouse. But! Here's a form he can sign and then we don't need him." 4:15 Get home. Fill out form, have Lut sign, and put it in mail, since it doesn't need to be done in person at all. 4:30-10; strip bed, do five loads of laundry, make bed, put away clean clothes. Also make dinner in there somewhere. Doing laundry didn't take all of those last five and a half hours, but it definitely took a chunk out of them. Tuesday, I got home to find yet more paperwork, including a ginormous form that Lut and I already filled out a month ago. The other form was from a law firm for my insurer, who wanted to sue someone so my insurer could get out of paying Lut's hospital bills. I wrote "none" on it a lot. SORRY INSURANCE COMPANY BUT YOU CAN'T SUE CANCER. I also swore disproportionately, because I am just really tired of dealing with bureaucracy plus cancer. Guys, I got to the end of my rope six weeks ago and it's just flailing and cursing now. I started to fill out the ginormous form again with Lut, and quit after thirty minutes because guh. I figured I could finish it Wednesday night. I also got a request for a big packet of stuff to send for a book thing next month and it's like a ten day deadline and ahhhhhhh. Oh, and I checked Lut's voice mail and he had a message from his neurologist's office that he needed a follow-up. Which I'd been wondering about. Wednesday morning, I called Disability again, and this time they answered! And didn't even tell me "we need to talk to Lut not you"! Me: Hi, you sent a letter that we needed to call? Social Worker: Oh, yes, we haven't gotten any of the forms back from you yet. Me: ... I sent in everything, what are you missing? SW: *pause* Oh, so you did. Me: ... so do you still need us to fill out this ginormous form you mailed two days after the other letter? SW: No, we got that. We just need stuff from the cancer center and the rehab place. I'll call them. Thanks! So I am not super-reassured but I'll go with it, I guess? So I can just worry about assembling stuff for the book thing, which is cool, I promise, and I will tell you all more about it when I know more myself. Them: "we can see him this afternoon!" Me: "... can I have a little more notice than that?" So I got that approved by my boss and told Lut. Things are happening and I am getting stuff done on many fronts, almost as if I were a real adult and not an obvious imposter. I had, briefly, lost my "fake adult" feeling while commuting twice daily to the hospital, but apparently it grows back. My brain keeps reminding me of all the things I haven't gotten done yet and I want to tell it JUST LET ME HAVE THIS OKAY? We are both extremely happy. I was skipping around in the hallways at the nursing facility as I gathered his stuff to get it into the car. We have a week's worth of his general medications, but only a couple of days of pain meds. I meant to call his new primary care physician about that but forgot. Dangit. Hopefully I can get it taken care of tomorrow. Afterwards, I left him to rest while I went to the nearest Microsoft Store, which is a half-hour away. The peripherals for the Surface 3 arrived on Tuesday. I am happy with the case and keyboard, but the stylus I got is terrible. I decided I wanted to test some in person, rather than ordering and returning one after another from Amazon. I couldn't find anywhere close that had floor models of styluses: hence, pilgrimage to MS Store. They only had one stylus, which was of course super-fancy and over three times the cost of the one I'd gotten from Amazon. On the other hand, I didn't actively hate the feel of it against the screen. Like the tactile sense of using plastic stylus on glass screen was extremely unpleasant. The MS pen has a softer nib and it feels much nicer. So I went ahead and bought it. At the store! Which I would have done even if it had been cheaper at Amazon, because I am not the sort of monster who will test things in a store so I can buy them only. But this was a weird case where it was cheaper in person. Amazon, for some reason, is charging $14 more for it than the retail price. I still have to return the other stylus to Amazon, and a pair of loafers that I ordered that doesn't fit Lut. I am spending so much more money at Amazon lately, but Amazon Prime is so nice. -_- On balance, Amazon Prime makes it actually easier to return items than things bought in person. I do have to print the label, which is annoying, but even with boxes that have to be dropped off and can't just be shoved in a mailbox, the dropoff locations for USPS and UPS are closer than most stores. And I don't have to wait at a customer service counter. OTOH, I am much more likely to buy the wrong thing online where I can't try it than I am in person, so there's that. Anyway, since I was relatively close to the nice Indian place on the other side of town, I went there for lunch. Why is naan so good. I don't even know. It's a buffet, and I had skipped breakfast because I was figuring on going there today. I have now also skipped dinner because I am still so full. SO FULL. The buffet includes bottomless mango lassi and also bottomless chai because OF COURSE IT DOES. I saw them packing a to-go order. I am getting food to-go next time because buffet is such a bad idea for me. They sent me home with a cup of chai and the remaining naan. After that, I stopped by a Chinese place to get to-go for Lut/ Lut got up to eat, then went back to bed. He is still spending most of his time asleep or resting, but when he's awake he is alert and lucid. So this is far from optimal but oh man, it has been SO MUCH worse. And it is just so nice to have him be home and me be home and we can be at home and comfortable together. We keep saying it to each other. "You're home!" "I'm home!" We are so happy, y'all. Later, I put away Lut's stuff that we brought home from the nursing facility, because I am temporarily possessed by the Spirit of Adulthood and don't want to leave things sitting around in bags for months like I normally do. My house is presently kind of almost tidy? I mean not really but SORT OF? And I want to keep it that way. And cuddled Lut some more. They told me on Tuesday that he should be discharged either today or tomorrow, which meant I had to cancel my plans to go to ProgPower. Which we'd always known I might have to cancel, but I still feel bad for not being able to go with Alinsa to it. Finding out the day before I was supposed to fly was annoying. But the tickets are on Southwest, so we canceled them and I get a credit I can use for another Southwest flight. So the money isn't wasted, at least. I could even use it for next year's ProgPower. Lut rested for a few hours, and then around dinner time he talked about shaving his head when we got home. I suggested we go to Great Clips instead, since it'd be pretty cheap and much faster for a pro to do it. "Okay," he said. "Let's go now!" It turned out there was a Great Clips less than a mile away, so we zwooped there, and Lut chatted with the hairdresser about his day and how he wanted his beard trimmed and suchlike, while I watched and played with my new Surface 3. Then we went to Backyard Burger (also close) for a snack. Because we were both still full from lunch but Lut wanted to get a cobbler anyway. I got a milkshake. Then back to the facility so Lut could rest more. He still spent most of today resting or asleep, but he was more alert, talkative and playful when he was awake, much more like his normal self. I've done some more cleaning since Sunday. The house isn't exactly clean, but I got most of the clutter that was on the floor packed away. The cat area and the kitchen have been mopped, and the kitchen is generally clean. The bathroom is mostly clean. And I vacuumed all the carpets. I still want to clean the bathroom floor and declutter the flat surfaces in the living room, but this is pretty good progress. LawnWoman and Friends have done an amazing job on the yard. Like you can see the yard again. They ended up ripping out most of the vines and scrubby trees that grew along the fence line, and flattening all the weedy bushes that were choking the front walk, and in general it no longer looks like my yard is about to eat my house at any moment. Her crew has been working since Sunday, with the bulk of the work done on Monday and Tuesday. They have done an incredible amount of work, like way more than I ever do, but now the yard will be much easier to maintain. Anyway, definitely feel like I'm getting my money's worth. Also so glad that they are doing the outside so that I had time to do the inside. The house will not be in perfect shape when he gets home tomorrow, but it looks considerably better than when I took him to the hospital back in June. And I still have 6 more days off before I go back to work! So I might manage the remaining decluttering. Or do something else constructive. It's been a good staycation so far. And Lut is coming home! It's Saturday! No word from LawnWoman yet, which to be honest is the story of my life at this point. I am not worried about it. It will get done by someone else or I will do it myself at some point in the next 11 days. But since I'm ostensibly not doing it now, I am using the time for something I can't hire someone else to do: decluttering and organizing my house. I also plan to clean, which I could hire someone else to do, but honestly the work I care about is decluttering and organizing and that's the hard part. Once I've done that, I might as well do the comparatively easy vacuuming and mopping and stuff. I started last night, by putting away some of the stuff that got moved when the ceiling collapsed last summer (yes, over a year ago) and never got put back. In the process, I found Lut's old phone. \o_ Lut hates his new phone, so I may see if I can get T-Mobile to give me an adapter for the new phone SIM card so I can fit it in his old phone. Anyway, Lut's closet held mostly electronics and empty boxes. Oh, he has clothes in there too, but it's a huge closet (like eight feet long and maybe three feet deep) and all of the clothes he actually wears are in a dresser. Most of the small stuff I packed back into two boxes and returned to the closet. It would make sense to throw it out, or at least to throw out 95% of it. Keeping spare network cables and power cords: fine. Keeping cords for peripherals we don't own and that don't fit to any computers we do: why. But I felt kind of bad about throwing away Lut's stuff and this doesn't take up a lot of space. I did throw out all the empty boxes, though. Seriously, he just kept boxes for every electronics thing we ever got. There were three monitor boxes in his closet and a dozen or so for different internal computer parts. The CRT monitor, though, I really did not want to keep. It is huge and it doesn't pack well: I can't put things on top of it and it's so heavy I don't want it on top of boxes. Moreover, it was one of THREE CRT monitors that we haven't used in 4+ years. Yes, I suspect it still works. I am also pretty sure we're never plugging it in again. Lut and I both have dual monitor set ups. We have a spare already on the desktop if anything happens to one of them. Anyway, Lut has always been like "why shouldn't we keep the spare old monitors" and I've always been like "because they take up SO MUCH SPACE" and he's not here to argue with me so I decided to get rid of them. Of course, you can't just put monitors on the curb for the garbage collectors to take. But I have a car now! I used Google to find an electronics center that was open and called them to verify that I could in fact show up and make my old electronics their problem now. They charged 35 cents a pound for TVs & monitors, and 20 cents a pound for scanners & printers. Everything else is free to drop off. (You can even take a tax deduction for other stuff, the place is a nonprofit). So I loaded up my car with ALL THE WORTHLESS ELECTRONICS. My two scanners that I haven't had drivers for in 7 years (cry). The printer. The TV set that has been unused in the basement since we moved in 14 years ago. Two CRT monitors. One dead flat screen monitor. A broken lamp and two broken fans. An empty computer case. I almost took my two dead weed whackers, but I didn't want to spend the time to (a) dig them out of my garage, which is chock-full of a friend's stuff and (b) verify that I didn't confuse the dead weed whackers with the one that works. I also tried to give them the pile of dead batteries from the basement, but alas, they don't take batteries. Technically, this is not actually all of the junk electronics in my house. We still have three old desktop computers and one CRT monitor, for instance. We still have a TV set we haven't used since 2004 and a VCR we haven't used in even longer. Probably some other stuff, too. But it made a substantial dent in the pile. My strangest find in the closet was Lut's duffel bag. It was almost empty, except for the following: one messenger bag, a paperback book, a cardigan, a box of tissues, and a mostly-empty box of tea bags, and a bunch of instant oatmeal packets. One of the packets had come open and spilled oatmeal all over the bag. This utterly mystified me at first: why would anyone put a bunch of oatmeal packets in a duffel bag and then put the whole thing in an office closet? But I figured it out! This must be the bag Lut packed when he left his last job. He would've kept the tea and oatmeal at his desk at work, for drinks and breakfast if he ran late. Then he never got around to unpacking it when he brought it home, and one of us got sick of it being in the way in the living room and stuffed it in the closet. After getting rid of the electronics (141 pounds of stuff I was charged for, and probably another 60 of stuff that was free) I went back to see Lut for lunch, and hung out at the nursing facility until after supper. Lut mostly sleeps or rests in between meals; he has no energy. :| He was able to stay awake for an episode of Defenders, so that was nice. Apart from that, I got some proofreading in. After dinner, I went home. I didn't really want to clean any more, but I decided to take care of the little remaining clutter on the floor of the front hall, which consisted of a desktop bookcase and its contents. It all needed to be dusted, but I got it cleaned up and stowed back on top of the table we use as a computer desk. I am honestly much less pissy about LawnWoman because even though the other services also promised things they didn't deliver AT LEAST SHE TALKS TO ME. I will give so much slack to people who communicate with me via text or email, y'all. SO MUCH. I like having a laptop of my own, but I'd also like Lut to have a laptop, especially if I go to ProgPower. He's rarely alert and competent enough to use one, but he'd probably be able to at some point if I'm away for four straight days. Since the Surface 3 is a couple of years old now, it's pretty cheap. I have Amazon Prime, but I paid for shipping because Amazon Prime would get it to me on 9/5 and $14 would get it to me on 9/1. I figured this way I'd have time to see how adequate it was as a laptop replacement. Bear in mind that my present laptop is also two or three years old, so I don't think I need the latest and greatest. My main concern is that I didn't like the Surface keyboard the one time I used one, several years ago. But that was years ago. Along with the Surface 3, I ordered a case, a keyboard, and a stylus. On Thursday, Amazon told me that the case, keyboard, and stylus had shipped and would arrive on Friday. Yeah, those are not gonna be a whole lot of use without the tablet. Friday morning, Amazon told me they'd shipped the Surface 3 and it would arrive on 9/2. Okay, that's a little disappointing but not terrible. Friday night, the peripherals still hadn't arrived. Well, I didn't need them before the tablet got here anyway. When I got home Saturday night, I had a box from Amazon! Just one box. It was a big box? It had Surface 3! And also the shoes I'd ordered for Lut, which weren't supposed to get here until Tuesday. Well. Okay? So I plugged in the Surface 3, which I am pleased to see uses a mini-USB cable just like my phone. I spent an hour or so getting it set up and updated and loading ArtRage and Clip Studio on it. Neither ArtRage nor Clip Studio works without a stylus. ArtRage almost works? I can kind of fingerpaint, but it treats "picking up finger and putting it back down elsewhere" as "you want to draw a straight line between those two points right?" Not so much. Clip Studio doesn't even try: it treats finger movements as "you want to drag the position of the canvas around" regardless of what tool I have selected. So the only thing I've done with it so far is use it for reading in bed, instead of reading with my phone. It works pretty well as a proofreading device. I wouldn't want to type on its virtual keyboard, but I can peck out corrections as necessary, and unlike with my phone, it doesn't have any trouble with Google Docs. My messenger bag has a little padded pocket which, it turns out, is a tablet pocket. The Surface fits it exactly. I am pretty sure once I get the case & keyboard, it won't fit. But if I keep the Surface to use as a laptop, I'll use a smaller bag and stop carrying the laptop in its messenger bag. Conveniently, I came across not one but THREE small messenger bags in Lut's closet. I suspect one of them will work very nicely for the Surface. I still haven't addressed my "I need a new phone" issue. I am leaning more towards getting an older phone now, though. A refurb Galaxy S7 is less than half what a Galaxy S8 costs, for example, and it's still going to be a hundred times more powerful than my Galaxy S-We-Didn't-Need-Numbers-Yet. This morning I really didn't feel like cleaning any more, so I decided to go to Panera, where mostly I'm just writing about what I did yesterday. I'm also In a bit, I will head off to the nursing facility to see Lut. I want to give my Surface some more time to charge; I thought I had it charging while I typed this but whoops. It'd come unplugged from the wall. Also, maybe I can get enough words written to finish one of the boss mobs I need in 4thewords. Anyway, this is my vacation so far. I have played some Tricky Towers in the evening for fun. Tricky Towers has a pretty small playerbase so its matchmaking only works in the evening, which has the side benefit of meaning I can't fritter away my mornings on it. But yeah, it's mostly decluttering, cleaning, visiting Lut, and proofreading. Yes, this is my idea of a vacation, and yes, I am very glad to be doing it instead of going to work. Also: yes, I am an adult. There was a time when I questioned whether or not I really was grown-up, but nope. I am. I am doing all the adulting. SO MUCH ADULTING. Weeks and weeks of adulting. I used to think that I would be really bad at caretaking, if I ever had to take care of my parents when they got older. It's kind of nice to know that I am okay at it instead. Not perfect. But okay. Thursday: Number of people who are supposed to come look at my yard and give me a quote: 2. Number of people who actually come: 0. Number of contacts I get: also 0. I'm not even mad any more. Whatever. I will start on my own yard tomorrow night and do a few hours a day until it's done. I'm on vacation next week anyway, and even if I go to ProgPower that's only Wed-Sun that I'll be gone, at most. Friday morning: one of the people who was supposed to come Thursday contacts me and says she had a friend pass away Thursday, but she'll come this afternoon. Well, that's a pretty good excuse. Okay. Friday 1PM: Another text: "almost done with this property, will head towards yours soon. Friday 6:15PM: I haven't heard from her since 1PM. I text to ask if she's been by, then drive home. Don't hear from her on the drive home. Welp. I feed the cat, and go out to do yardwork. I move out some of the giant fallen branches off the lawn, then figure I should see if the lawn tractor will start. It starts! I still am not sure how to make it mow, but hey, maybe this will work. I get the loppers and go out to clear the front porch of overgrowth so I can see if UPS delivered anything to my front porch. While I am there, at about 7PM, LawnWoman appears! She made it! She is apologetic about the many delays. I show her around my massively overgrown lawn. She takes pictures. She gives me a quote. It is a lot, but it is still less than it would've cost to have a lawn service for the last three months, so eh, okay. I hire her. She is supposed to come tomorrow with a crew. She may finish tomorrow, or might finish Sunday, depending how things go. Given how things have gone so far, I am not super convinced I will get a trimmed and mowed yard by Monday, but we'll see! Maybe. So the lawn service I called on Friday night, Lawn Love Lawn Care, showed up on Monday night. The guy called me at 4:50 to tell me he'd be at the property in 10 minutes. I called him back at 5:30 (I do not get home until 7ish, generally) to ask what the cost would be. He couldn't give me a quote, he said. He talked to the office and they would call me later with a quote. At 6:30, the office left an automated voicemail (the phone did not ring) saying that they'd emailed me a quote. They had not emailed me a quote. At 7PM, I called the office to ask what was going on. "Uh, we can't give you a quote yet, we have to transfer you to another service with different equipment, we'll get back to you ... later." "Well, you're scheduled for Wednesday?" It's now Wednesday night and guess who has never gotten back to me. I don't know why "no" is so hard for businesses and "string you along until you are pissed off and furious and determined to badmouth them publicly" is so easy, but that's where we are. Lawn Love Lawn Care: NOT RECOMMENDED. Like, seriously, if you're not gonna do it just freaking SAY NO. Don't tell me you sent me a quote when you didn't. Don't tell me you'll get back to me when you won't. SAY NO. It's not THAT HARD. Anyway, I give up. I will figure out how the riding lawn mower works and spend however long it takes getting the yard under control again and just see hardly anything of Lut and generally kill myself, because it's easier than wasting an unknown number of weeks looking for the mythical person who is willing to take my money and do it. Because hey, it's Wednesday, and even if I call someone tonight the earliest I will get a "we've looked at your property and will maybe contact you someday, who knows, about how much we would charge to do it on some other day but definitely not any time soon" is next Monday. In a triumph of hope over experience, I decided to call one more service, mostly because I am too upset to relax and I know I'm not going to have time to dent the horror that is my yard until the weekend anyway. Third service says they will come tomorrow and give me a quote. So on Monday, I texted the lawn guy my coworkers hired, and he said he'd mow my lawn on Tuesday. Tuesday, he texted after I got home (at 7PMish): "Too wet to mow today, I'll come tomorrow." Which was fair: my grass is like two feet tall and it had been raining, and mowing tall wet grass is pretty awful. Wednesday: I got home at 7PM again, and the lawn wasn't mowed. Huh. Thursday morning: T asked if Lawn Guy had texted me. "He texted me and said he couldn't get through the gate. And also that it looked like it hadn't been mowed in a year. I told him he should text you," she said. "It's been two months, and yes two months of grass is horribly overgrown. You can get in through a gap on the south side of the lot." I told her. "I don't think he's going to do it." "He'd better do it! We already paid him!" "... Maybe you'd better get your money back," I said. But I texted Lawn Guy to explain about the entrance. Lawn Guy: "All right, I'll mow it tomorrow." Paying people to do things for you is hard. I guess I could devote the entire weekend to dealing with my own lawn. Maybe if the new guys also turn out to be jerks, I will call in sick on Tuesday and do nothing but yard work. The problem is that not only does the lawn need to be mowed, but the only working lawn mower I have is the riding one and I am super-nervous about trying to use it. It's weird and finicky and sometimes gets stuck in pot holes in my lawn. Also, there are bushes and stuff that need to be hacked back before they eat my house, and also that prevent mowing because they partially cover the lawn (not enough to stop the plants from growing, just enough to keep a human from getting to them). My yard is just really terrible. I regret everything. It's Saturday morning now and I was kind of thinking of waiting to see if Jerkface Lawn Guy would ever contact me, but he hasn't. So I texted him to tell him to give my friends their money back. Anyone wanna bet that after the new service deals with it, Jerkface tries to claim that he mowed and won't give a refund? "If There's Anything We Can Do to Help"
People at work have said this a bunch of times, and of course I can't usually think of anything people can help with. But on Monday, one of my co-workers said it and I remembered a problem I meant to ask at work about. "Do you know any lawn services? I need to hire someone to take care of my yard." "I don't, but T might? I know we have some customers who run services. I'll ask T."
T: "I use a service! I went to high school with him, he mows lawns for everyone I know. I texted him, here's his number. You can just text to ask him if he's free." So I texted him, and he texted back an hour later with "sure, I'll mow it tomorrow, what's the address?" Okay, this is a little weird that he didn't say the price, but maybe he figures he'll quote one when he sees the property. I texted him my address. A little later, F says "Hi, did you get any good pictures of the eclipse?" "No, bbut I got some bad ones. Did you want to see?" I looked up to see my cubicle surrounded by beaming, conspiring co-workers. "Hi?" T: "So we all chipped in and we're gonna pay for the lawn service this time. It'll be a bit more than usual because it's been a while but don't worry, we're gonna cover it." Awwww. ♥ All I really wanted was to be able to pay someone so I didn't have to worry about my yard any more, but that was extra sweet. On a related note, I have a different "I just need someone else to research this because I am too brain-fried to do it" problem. As I've noted before, I use a Samsung Galaxy S, a seven-year old model, because it has a horizontal physical keyboard and new phones do not. My Samsung's backspace key is dying, and I am facing the fact that getting another copy of seven-year-old phone is not a great plan. The software I've been using all along keeps upgrading itself and no longer runs well on my antique phone. I can't get a new model of a phone with a horizontal physical keyboard built-in. But several people pointed out last time I mentioned this that you can get bluetooth thumbboards, some of which are set up so they'll clip to the phone or have a place for the phone to stand or something. * a horizontal thumbboard (ie, a physical keyboard of approximately the same size as the phone, operated by thumb) that will attach to said phone, so that I can use the thumbboard and see the screen easily while standing/walking/waiting in line/etc. So either phone or thumbboard needs to have a way to attach to the other so that I can hold and see both comfortably while using the thumbboard. I've tried vertical thumbboards and they are too narrow for me; I need one at least 4" wide. * I am not fussy about phone size. Good battery life is a plus, but I am resigned to carrying a spare USB battery so not a big deal. * Lots of memory also a plus. I would love a phone that could edit large Google Docs files, though I do not know if such a thing exists. In other news, Lut has been noticeably more like himself on three of my last four visits. I hate to get my hopes up, and he is still nothing like baseline. But it's a positive direction and man I am a lot more kindly disposed to the skilled nursing facility. Whether they have any part in it or not. Please keep praying. Editing proceeds apace. I am about 5/6ths through the penultimate pass. The last quarter of the book is my favorite part, so probably will finish this pass this month. The last pass is just "look for editing artifacts" so hopefully won't take as long. We'll see. I've been a car owner for 15 days now. My car's name is Ardent Purr the Adoracar, because decision is for other areas of my life. As of the 14 day mark, I'd driven her about 500 miles. This seems like a ridiculously high number. I checked and it's below average for an American driver. Americans are crazy about driving. I am tired all the time now, even when I get a full eight hours of sleep. People keep saying "don't forget to take care of yourself" and I wish I could. I'm eating as much and as well as I did before Lut went to the hospital. The main thing I gave up was exercise. I do not have time to commute 90 minutes a day and work full time and see Lut for a few hours each day and still exercise. I am still editing. I've hacked about 12,000 words out of the manuscript now. I am startled by how much of that is just "saying the same basic thing more concisely". I still need to add a few things, but I'm just changing stuff as I get to it at this point. I've written a little fiction, but only a little. I miss the #PollRPG -- I was thinking about it when I did the first title poll this week -- but I am not sure what to do with that. Writing a story where people shape the results as I go means I can't build a buffer or plan out the story that much, and "write when I feel like it" doesn't work that well if I want an audience to follow it at the same pace. Editing and writing at my own pace works okay with the cancer lifestyle. Not so much on a schedule. :| Maybe I will do a poll about it at some point. I have acquired New Car. Many thanks to everyone who offered car-buying advice! 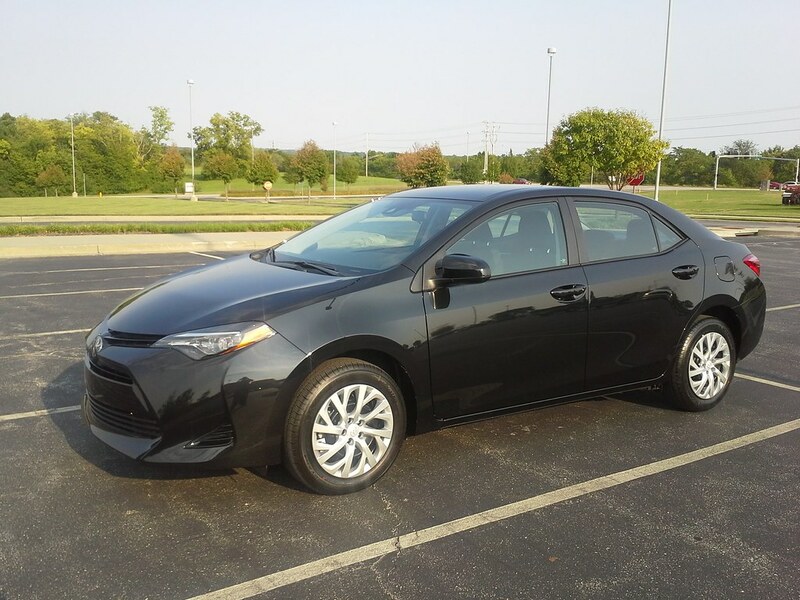 It is a 2017 Toyota Corolla LE, chosen for its combination of safety features, size (Lut does not fit well in a subcompact, which is what I'd've bought otherwise), reliability, and price. Telnar offered to walk me through the process of car research via Consumer Reports. I made sad pitiful noises at him, and asked if I could just turn the puzzle upside down and see what the answer was instead. So he did the research and gave me a few options and the reasoning behind them. After settling on a car, I did go through Consumer Reports myself. Dealing with dealerships online was surprisingly painless. There are three Toyota dealerships in my area. Dealership # 1: "We have two Toyota Corollas in stock. Call us to find out about pricing." Dealership #2: "We have three Toyota Corollas in stock. We want over $1,000 more for them than Consumer Reports, which we know you were just looking at, thinks they're worth." Adams Toyota: "We are researching what we have on the lot and will get back to you shortly!" "We'll sell you a Toyota Corolla LE for $500 less than what Consumer Reports says is fair, and slightly less than the average price for your area." At that point, I just said, "That sounds good and they didn't make me dicker for it. Sold." I called my local friend Corwyn and asked if he would come substitute for Lut in a test drive of the car: that is, sit in the passenger seat and make sure he fits. Corwyn is taller than Lut and of a similar build, although obviously Lut, with two compression fractures in his spine, has more flexibility issues. Still, he could give me an idea. The Corolla is snug for Corwyn, but he does fit. I told Charly, the salesman, that I would take it. I picked out a black one, because they had several colors and if you could get black why wouldn't you get black? * I could've saved seventy-five dollars or so by getting a white one that came with cheaper floor mats**, but I decided I was willing to pay a slight premium for black, after all. It's possible that if I'd been more dithery, or if I'd waited a month or two until they were more desperate to make room for 2018s (they had a lot of 2017 Toyota Corolla LEs in stock), I could've gotten a better price, but I am content. I made the decision to purchase on July 27, and requested a 401(k) "loan" the same day. Name notwithstanding, this is not an actual loan. There is no approval or qualification process: I ask for it, I get it. In effect, it is me taking the money out of my 401(k) and formally promising to pay myself back (at 3% interest). It's not like a margin loan, where I'd pay interest to a third party while my money remained invested. I'm paying myself. If I failed to pay myself back, then I'd have to pay the government the early withdrawal penalty and taxes for the money I took out of the 401(k), but there's no collections process involved. It's all my own money. The next day, the 401(k) people told me it would take 3-5 business days to fund it. I emailed this to Charly: "So I should be back between 8/1 and 8/4, depending on whether or not yesterday counts as the 1st business day." At 9:30am on 8/2, Charly emailed me for a status update. I hadn't heard that the loan had been funded yet, but I work at my bank so I checked my account. The funds had arrived 30 minutes prior. I went to the teller line to get a cashier's check (they would've taken a personal check, but I don't know where my checkbook is -- who writes check? -- and I work at a bank so cashier's checks are easy and free) and emailed Corwyn to get a ride. By 10:30, we were on our way to the dealership. Having made the decision, I was really impatient to finish the whole process. Which still took like two hours, even though I was paying in cash. Buying a car is complicated. I returned the rental that evening, with oddly mixed feelings. Yes, it is cool to finally have my own car, but I've been renting from the same office at Enterprise for eight years or so. They all know me. And up until now, when I need a car every day, it was a very cost-effective way of handling my transportation needs. I am kind of sad not to be doing it any more. Even now, I wonder if I should've gone with a short-term car lease, or some kind of arrangement where I'd have a car for several months, until Lut is stable and at home, and then go back to renting a car as needed. But owning a car does save time, vs going to the rental place and picking one up, and returning it afterwards. And the Corolla is beautiful and I love her. As soon as I purchased her, I stopped being practical about her and became immediately sentimental. I may end up as one of those people who washes their car every month. I'm sorry. She is a much fancier car than I would have acquired, left to my own devices. 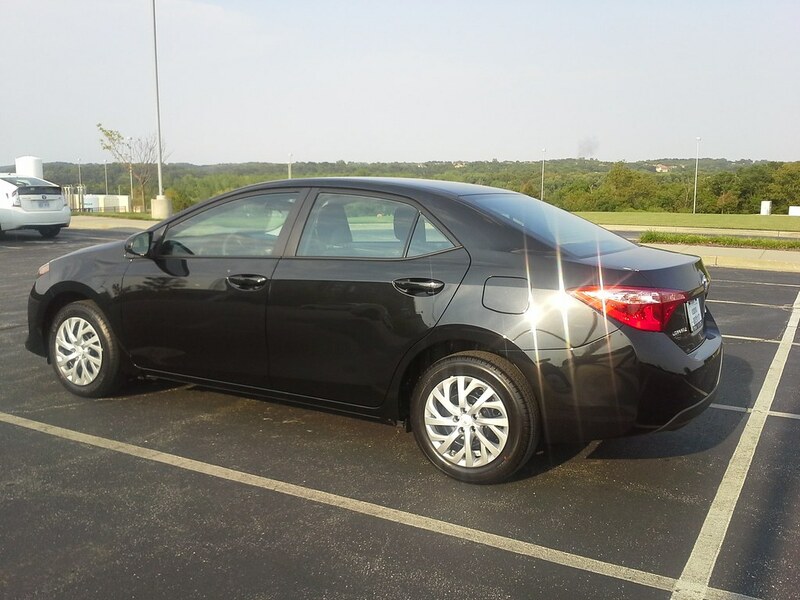 She doesn't have any extras (beyond the pricer floor mats), but lots of things come standard on a Toyota Corolla LE. The standard things that made me pick this model of car are safety features, like pre-collision detection and automatic braking. Some things that I thought were just safety features turn out to be nice features for general driving. For instance, its cruise control is coupled with a radar system that detects when a car is in front of you and slows down accordingly. This makes cruise control so much more useful. Even when the road is crowded, I can leave cruise control on and the car will automatically adjust the speed whenever someone pulls in front of me or I catch up to someone moving slower. I use cruise control for the nine-mile highway drive from my home to the hospital, which I've never bothered doing on any other model of car. It's nice. It also has a USB port, so I can plug in my iPod for music without needing any intervening doodads, which is convenient. And I can charge devices off of it with just a USB cable. Those are the main extra things that I routinely use. It has a bunch of other doodads, like it syncs with my phone to take phone calls. I am honestly not sure this is a great feature, since even hands-free phone calls are a distraction when driving. But Charly set it up so it's there for when the hospital calls while I'm driving. Until the bluetooth thing randomly fails, which is my usual experience with bluetooth. I want to get decorative magnetic decals for her, but it may be too much effort to find/make the kind of thing I want. I'd like a trim design similar to City of Heroes' "tribal" pattern, to curve along fenders and the bottoms of the doors. I haven't seen anything like what I want. A bunch of die-cut flowers, though. Maybe I will bling her out with those. I haven't settled on her name yet (of course she is going to have a name). I am debating between Purr (after one of my black dragons in Flight Rising) and Ardent (after The Moon Etherium protagonist.) So I'll put in a poll for her name! Poll #18661 Name that Car! What should I call her? * I may have been ruined for other car colors at a young age by K.I.T.T. ** I don't know why car floor mats are expensive, but they are. Lut is still at the hospital. He's in a regular room now, and he's off the IV and the monitoring equipment, which is nice (no more wires to worry about every time he moves). He's been eating on his own. He gets up a couple of times a day, with assistance, and sits in the hospital room recliner or stands by the window for a little bit. Other than that, he mostly sleeps or tries to sleep. His back hasn't been hurting as much and he hasn't been needing a lot of pain meds, which is good. His mood is good under the circumstances. He knows where he is and he's polite, patient, and appreciative. Conversations with him don't work very well. I can't tell if he's having delusions or just trying to tell me about a dream or a game he used to play or something. Physically, he's better than when I took him to the ER 3 weeks ago, but I don't think the hospital is really helping his mental state. And he's not reading or playing with a computer or any of his normal activities, because he's too tired even for things he can do while lying in bad. At most, he'll watch a show, and he doesn't have attention for even that most days. Case management at the hospital is trying to place him at a skilled nursing facility. He is to get rehab there and then he'll be able to come home when he's better able to take care of himself. Placement at a skilled nursing facility is hard, because of some combination of insurance, Lut's particular needs, available space at facilities, and probably some other things I'm not thinking of. I have some lists of good car models for my needs and the probable prices for them. I have not gone shopping for one yet. I should probably do that this week. I kind of have the feeling I will go with the first dealership that has a reasonable car on the lot and doesn't seem like total scum. I do not have high expectations.